As you wend your way through a vast sea of wildflowers, switchgrass & big bluestem, past the windmills and scattered clusters of Black Angus on the gently undulating plains of western Nebraska’s Grant County, you’ll come upon the tiny township of Hyannis, a wee burg on the hinterland prairie. The county seat with a population of 287, if you luck upon its red brick courthouse on a Tuesday or Wednesday afternoon you’ll partake of the rare chance to view the local museum’s world class barbed-wire collection and John Wayne’s saddle from the 1969 movie True Grit. Sharing the same determination, fortitude and reserve of character acted out in the span of The Duke’s cowboy film career, Terry Connealy followed the Loup River eastward to Lincoln and enjoyed the thrill of a lifetime. Question: Hey Terry, thanks for making the time for me. So what are you doing nowadays? Terry Connealy: I’ve worked for Wells Fargo covering the western half of the country for a division of their mortgage company called Private Mortgage Banking… lending to the affluent client. (UPDATE: Now with Mutual of Omaha Bank as President of Mutual of Omaha Mortgage, leading their residential mortgage team) It’s pretty fun. A pretty neat group, to say the least. Q: How did you get hooked up with them? TC: It’s kind of a funny story….I was in the financial services business and I was selling stocks, bonds, and mutual funds, setting up 401K’s, and I got a call from a gentleman from Wells Fargo that had actually been referred to me by Doak (Ostergard). Probably the only reason I returned his call was because he dropped Doak’s name in there. (laughs) Nine months later I joined (them), and I look back and it’s been a wonderful move…couldn’t be happier. Q: Last time we talked you mentioned you’d read Jim Collins’ book ‘Good to Great’, so would you say that Wells Fargo is still running the same type of operation as was highlighted in the book? TC: I really would. And it’s been a while since I’ve read Good to Great, but it uses Wells Fargo a lot as a company that’s gone from good to great. Nothing’s really changed; a very consistent company. Leadership at the top is very consistent, very modest, and we continue to just keep doing things as we have before. A lot of consistency in the company. Q: Sounds like you’re describing Nebraska Football of your playing days. TC: Yeah, and I really do think there’s a lot of similarities. 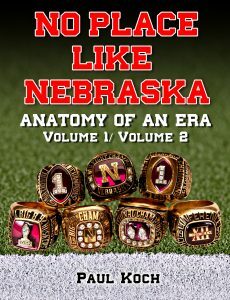 I look back at my time at Nebraska and the obviously fantastic leadership: consistency in the leadership and in the way we approached things. And probably the other thing: there is just a great work ethic. Nothing is going to be given to you; you have to go out there and earn it. And earn it every day. And if you do that, everything will fall into place. Q: I’m thinking you’re a pretty blessed guy going from Nebraska football to an organization like that, but in the meantime where did you go? TC: Right. 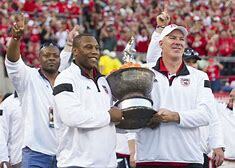 After I graduated from Nebraska after the Orange Bowl? Obviously I thought I’d better at least see if I could play in the NFL, see if I could get a chance or opportunity. I played in the Senior Bowl and then continued to work out. And I didn’t get drafted, but I ended up a having offers from several NFL teams right after the draft and actually went to camp with the New York Jets. I went to their mini-camps and some of their training camp and got cut there, and ended up getting signed by the Packers. So I spent a little time in Green Bay before I realized I was in over my head. I didn’t have the talent and the size to compete at that level, especially the Packers. It was something. At the time it was certainly difficult, but I don’t have any regrets. I knew that it was probably a long shot for me to play in the NFL just because trying to play noseguard/defensive tackle at 265-270 lbs. was a reach, but I also knew that if I didn’t give it a try I’d probably always regret it and always wonder if I could have. I gave it a try and found out pretty quickly that it wasn’t going to be for me, but no regrets. Q: Was there one major thing that signaled to you that it wasn’t to be? TC: Well, when I chose the team to sign with, I think I had offers from 10 or 12 teams. I chose the Jets, quite honestly, because the Jets were one of the poorer teams in the league and didn’t have a ton of depth and a lot of guys really sticking out there. If it’s a long shot to making the team you don’t want to go the the Super Bowl champions and try to get on their defensive line, so I went to New York. And actually with the Jets, I thought I had a pretty good chance to make the team, and if I didn’t make the team, to at least get on their practice squad. And then it kind of turned out I got caught in a numbers game: some guy had been holding out. They had to sign this guy and they had to make room, and I was the guy to get let go. But when I got to Green Bay and the NFC Central, Reggie White was there. And I was the smallest defensive lineman/tackle by probably 35-40 lbs. and just was probably not big enough to play defensive tackle/noseguard. I would hold my own a couple plays, but I just wasn’t big enough and I just wasn’t fast enough to be out there on the defensive end spot. So I realized pretty quickly that I just didn’t have the physical makeup to be playing for the Packers. Q: Is their fan base as rabid as Nebraska’s? TC: You know, I will always be a Green Bay Packers fan after my experience there. When I went to New York it was pretty evident at the time why they were the worst team in the NFL. (laughs) Just the atmosphere there, how it felt around camp and how the coaches interacted? And then you went to Green Bay and it was the polar opposite. It really did remind me of Nebraska. That fan base was fantastic, the coaches seemed like they really had a vested interest, that you were more than just a number to them, that they cared about you. There were just a ton of similarities between the Packers and the Huskers. And it’s funny, but the next year or two years later, a lot of the same coaches and same players that were in camp? The Packers went on and won the Super Bowl. I wasn’t surprised at all, there were a ton of similarities between there and Nebraska. Q: What was the most telling? TC: To me the most telling thing from a player’s perspective was the coaches and the leadership. Mike Holmgren was the head coach and just a good guy that sincerely cared about you, actually knew who you were. When I was with the Jets none of the coaches knew who you were, you were just whatever number was on your jersey. Then all of a sudden I got to Green Bay and I was an undrafted free agent and had already been cut by one team, and Coach Holmgren makes it a point to come up and introduce himself when I get to camp. Just very impressive. And when I decided to leave camp they came and spent some time with me and thanked me and wished me luck. I think the biggest similarity was just the way the coaches treated the players with respect, the caring. Obviously, I have didn’t have that much experience -that’s my only experience- but from what I’ve heard and read that’s certainly not the norm, I don’t think. Yeah, you’re getting paid to play the game and it’s your job and it’s a business, but I don’t think it’s a coincidence the successful people in the NFL have something special there. Q: Let me ask you: coming from Hyannis, did you play 8-man or 11-man football? TC: I played 8-man. Where are you from? Where did you go to high school? Q: A little town called Petersburg. Pretty close to Albion. TC: Was that the #41 on the license plate? Q: No, that was #23. I think #41 was York County’s number, if I recall, about halfway to Lincoln from my hometown. (laughing) What position did you play in 8-man ball, Terry? Q: Kind of like a day on the farm? You go where you’re needed most? Q: And if you did, it was usually against 105 lb. freshmen, right? TC: Yep. It didn’t really do you any good. (laughs) I absolutely loved playing 8-man football. Arthur played 6-man and some other schools around us did, but we never played any 6-man games. And the beautiful thing about 8-man is that it’s 3 less guys and a smaller field, but really the rules are the same. You’re just playing a smaller version of 11-man. TC: Yeah, right. I never played an 11-man game until the Shrine Bowl after my senior year of high school. Q: Were you concerned about the adjustment to the eleven man game? TC: You know, a little bit. I remember going to camp for the Shrine Bowl before the freshman year of college and it being just a little bit different in trying to learn your assignments -you’ve got a couple extra guys out there and the like- but for the most part you were doing the same thing. It wasn’t that big a deal. It was a much bigger transition when I went from that to camp at Nebraska a few weeks later. I never had any idea that there was so much technique to being a defensive lineman. In high school playing 8-man football, at the time I was one of the biggest and fastest guys, and you just kind of played by instinct. You knew what you were supposed to do, and then you get down to Nebraska playing the defensive line and Coach McBride is talking about “a 6-inch step here followed by a twelve-inch step there and your hands are here.” (laughs) My head was swimming. Truly, I never knew that there was that much technique to being a defensive tackle or a noseguard. Q: Even the bull rush has a technique to it? TC: Yes, and you found that out real quick when you started two-a-days. Q: Did you get recruited as a defensive lineman, Terry? TC: You know, really, when they recruited me they didn’t exactly know where I was gonna go. I’d gone down to the football camp at Nebraska the summer year before my senior year of high school football and, gosh, they moved me around and put me over with Coach Brown at the tight ends, they put me down with Charlie at the D-line, and I think I even worked with the linebackers. So when they recruited me it was kind of between a tight end and defensive tackle. And Charlie evidently said, “I want him on the defensive line,” and that was the only position I ever played, was noseguard and defensive tackle. I wasn’t 100% sure when I got recruited where I was gonna end up. Q: You were recruited as an ‘athlete’, per se? TC: I would say that’s a stretch. (laughs) I’d like to say that was the case, but I was destined to be a defensive lineman. Q: (laughing) So your freshman year was the fall of ’90 or ’91? TC: That was ’90. I redshirted my first year. They still had the freshman team actually; the last year they had the freshman football team, but I didn’t play on it. So at that time they still brought in 100 freshmen and there were probably 15 or 18 of us that redshirted, and the rest of the guys that came in that year played on the freshman team. Q: Take me back to your first day or two on campus, what stuck out to you? TC: Oh, yeah, it was so different from where I had come from, obviously, just the whole experience. The first class I ever sat in on was at the auditorium in Love Library. And I don’t know how big it was, but I remember thinking, ‘There’s more people in this class than in my entire hometown!’ (laughs) There probably was. I’m guessing that auditorium seated 400 people, but it was a little different. But as far as the football, in Hyannis? Just a wonderful experience. I had a fantastic coach my junior and senior year: Chris Krause. And he’s coaching in Hyannis even today (2011). A wonderful coach. And we had an assistant, Bob Waldman, those were our two coaches, and you get to Nebraska and, gosh, you’ve got three Grad Assistant coaches and specialists and the like. Obviously, it was different for me to be a defensive tackle and a noseguard, and you went to your own meetings for noseguard before practice, just with your position, and the structure of the practice. It was a well-oiled machine and you could tell that from the second you even started the recruiting process, “Here’s where you are supposed to be, here’s what you do, here’s how we run things.” And if you did what you were supposed to do and worked hard, it set you up for success. The road map was laid out for you, what you needed to do. Q: Just plug you in and let your work ethic and perseverance take over? TC: Yeah, that’s it. And the thing is, the guys that had been in the program? You followed them. They were leaders and they knew what was expected. And even though the coaches obviously played a huge role in it, it was the upperclassmen, the role they played trickled down to you, and it’s amazing the consistency. We were very, very fortunate. And I look back and I can’t remember -the whole time I was there, Paul- any change in the assistant coaches. Turner Gill came on, but I don’t think anybody left. Right? I think Coach Osborne was coaching the quarterbacks. Maybe there was a change in the rules where they were allowed to bring another coach on, but I can’t think of anything other than the GA’s rolling through and the like. You had Steele at linebacker, George in the secondary, you had Tony at defensive ends, you had Charlie at tackle, you had Ron Brown and Milt and Dan and Osborne and Solich, and then you brought Turner in. So my recruiting class, I don’t think we had a single turnover in the assistant coach ranks. Now, after I graduated, I think the next year maybe Tony left and Kevin left, but truly I was there for a 5 year period and unless memory fails me, the leadership in that team did not change a bit. Q: Speaking of leadership, from your freshman year to your senior year it seemed to me there was a change in the mindset of the team. Would you agree with that? TC: Well, from the players leadership or coaches leadership, or maybe both. When I got there we had it on the defensive line. We had some great leaders that were team captains, a friend to this day: Pat Englebert. Pat led by example and did all the right things and the like.